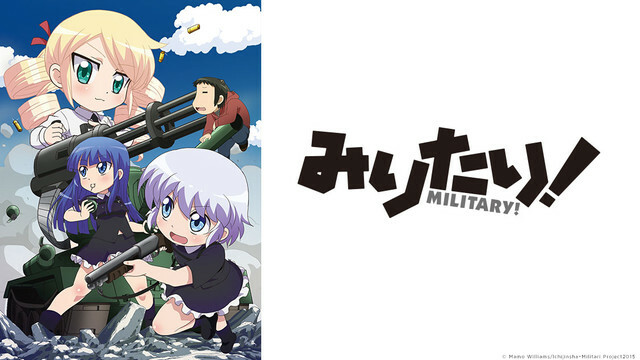 If you're wanting some military action featuring lolis and pantsu, Military! is the one for you. An anime shorts that came out back in January, Military! does not fail to have an episode filled with at least a couple of explosions. The main character and victim in all this is Yano Souhei whose father was accidentally sent to lead the Krakozhian Army in the war against the Grania Republic. Sent to him are First Lieutenant Luto and Second Lieutenant Haruka who are supposed to protect him from the enemy, but are actually putting him in more danger than he was before! Being under 4 minutes long, you can guarantee fast-paced action mixed in with the comedy. Souhei must deal with being "protected" from others who have come to assassinate him, but the poor guy just ends up being caught in the cross-fires somehow. We have a girl called Shachirou who loves boxes and whose personality reminds me of Tina from Black Bullet. She's later joined by a fellow comrade who must act like a dog (because, reasons). Anyway Luto and Haruka go to extremes in order to exterminate the dangers to Souhei, which includes modifying everyday things such as the kotatsu (that episode is hilarious). Tanks and other military weapons are included, but you have to credit their creativity. Add in a bunch of other characters (mostly lolis) who have come to bring some excitement into Souhei's life, along with some letters to Luto and the group from this father. It doesn't just stop there, for there are plenty of pantsu and comedy in the very short episodes. You'd expect it to be longer with all the content I've mentioned, but it manages to fit all this in without declining in quality. Military! brings you all the action brought into a boy's life who seems to be in even more danger than he was before. There are also 5 seconds' worth of military courses at the end of each episode (how you learn from this is an achievement in itself) which also end in explosions. Anything else? : Kotatsu tank wars!